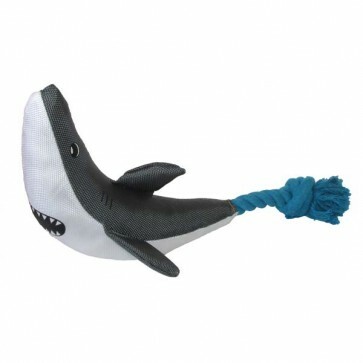 Good Boy Wild Tugs Shark is an interactive dog toy that's made from tough, canvas and rope with a squeaker inside, which has been designed to be super strong and ideal for tug of war, as it allows the owner and dog to hold onto one side each and pull as hard as they can. The wild tugs shark is also suitable for chase and fetch games as the dog toy can be easily thrown long distances by using the attached rope. Good Boy's Wild Tugs are available in three funky designs; a lizard, shark and dinosaur that are all made from non-toxic materials and held together by heavy duty stitching to make the dog toy tough and durable.